Nubuck is similar to suede, but it is stronger and thicker. Nubuck is soft to the touch, scratches very easily and darkens temporarily when water drops on it. Nubuck is resistant to water. Women’s nubuck boots are not necessarily associated with season. You can wear a pair of nubuck boots all year round. The color of the nubuck boots is what determines when they are worn. Choose dark colors for the winter and light colors for the spring. Although nubuck can be worn in the summer as well, we wouldn’t recommend wearing boots in the summer, unless they are specially made for this season. Nubuck boots are great for casual outfits. Choose your favorite color and wear your boots with a pair of jeans or a skirt. 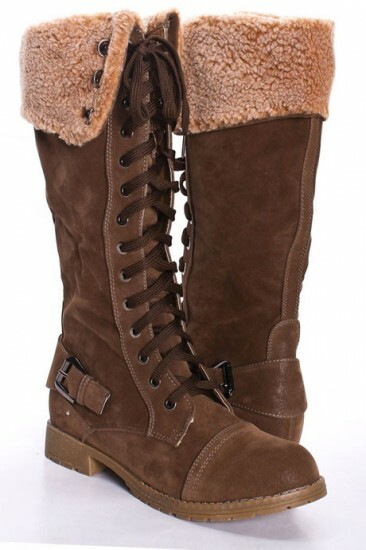 Depending on the style of your clothes, choose women’s nubuck boots that look good with the rest of the outfit. There are different lengths, heel heights and models. So if you want to buy a pair of nubuck boots, put on your favorite outfit and try on different models. Try to imagine what they would look like with other clothes, too. We would generally recommend wearing nubuck boots when it’s dry outside. Although this material is water resistant, it darkens when water falls on it. It returns to its original color upon drying. Nubuck shoes should be brushed with a soft bristled brush to lightly lift away dirt. Use specialized cleaning products on nubuck. Before cleaning, make sure your nubuck boots are dry. If you want to buy a pair of nubuck boots, you should keep in mind that they require more maintenance than other types of leather. It is a good idea to apply a protective spray coating at least every six months. Never attempt to clean nubuck with water. Regular wiping with a nubuck cloth will prevent you from having to resort to leather degreaser and leather cleaner.